SessionMaker is an evolving Editor to create your own session files that can be imported and run in the Mind Massaging Machine. This way you can build your own library of hypnosis files and mind massages. Creating a new session discards the current session. If you are already editing a session, all unsaved changes will be lost. Loads a .mmm file from your file system. Saves the session file, effectively overwriting the session you have currently open. This opens a Save File dialog where you can give the session a new filename. You can export a finalized session file. A finalized session can not be edited by anyone. If a finalized session is loaded into the SessionMaker it will only show general info (Name, Description, Icon), no information or details about any used features are displayed or editable. Attention: You do not need to finalize your session to be able to import a session into MMM. Any saved .mmm file will work. This feature only exists to provide basic write-protection for those who create commercial content. The name of the session as it will be displayed in the Session Library of the Mind Massaging Machine. Please give a short but detailed description of what the ession is supposed to do and achieve. This is the image as it will be displayed in the Session Library. Using an image with square layout is highly recommended. While transparency is supported it should not be overused. If you want, you can mark the file as looping. Whe the session is completed it will just start again from the beginning. You can choose a file that will play in the session. You can enter words or short phrases here. Each line will be interpreted as its own subliminal. 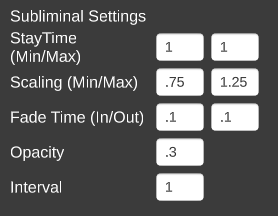 These settings dictate the frequency size and duration of the subliminals that will appear ranomly in the genaral viewing space of the user. This is how long the subliminal will be shown. You can set a minimum and a maximum, if the values differ, a value will be randowmly chosen beween your given constraints whenever a new subliminal is about to be shown. You can decide if the subliminals should vary in size and how much so. You can set a minimum and a maximum, if the values differ, a value will be randowmly chosen beween your given constraints whenever a new subliminal is about to be shown. These two values define how long it takes the subliminal to fade in and out. So for example you could have subliminals to appear in just 0.01 seconds but slowly fade over 0.5 secods. This defines how visible the subliminal is when it has completely faded in. Opacity can range from 0 (fully transparent) to 1 (no transparency at all). The interval governs how many seconds it takes for a new subliminal to start appearing. So, with a value of 1, every second there will be a new (randomly selected) subliminal to appear. If the value for StayTime is longer than the Intervall there will always be more subliminal at once shows to the user. Choose a small intervall for many subliminals to be seen, a big intervall will make subliminals fewer with lots of time in between. Here’s a selection of visual effects you can choose from to use for your session. You can add any number of pictures to use as subliminal pictures. So far, JPG and PNG format is supported. Transparency included in your PNG file will be preserved. Brainwave synchronization is the attempt to use external stimuli to change the main frequency of the brain. Please us your favorite search engine to find information, research material and effects of certain frequencies. Each ear gets a tone played to, defined by the value set in Base Tone. Both tones get modified so that the difference in Hertz equals the desired branwave frequency. The human brain combines both tones and a pulse is “heard”, this pulse has the frequency difference and thereby the desired brainwave frequency. Each ear gets a tone played to, defined by the value set in Base Tone. These tones are modulated in volume to create a pulse. This pulse has the desired branwave frequency. The screen emulates a strobe light effect, overlaying the rest of the view. This effect is easy enough on the eyes to be comfortably viewed with open eyes and not very distracting from the other visuals. The Strobe Light has the desired branwave frequency. All frequencies are defined in Hertz and all durations are in seconds. This is the brainwave frequency used at the start and end of the session, while the user is “awake”. This is the brainwave frequency used for the main part of the session, while the user is supposed to be or reach a trance state. This is the time it takes for the brainwave frequency to transition from the Wake Frequency to the Trance Frequency at the start of the session. If you use an audio hypnosis file you might want to set this to the time it take the file to end the induction part. If you want you can enable this. 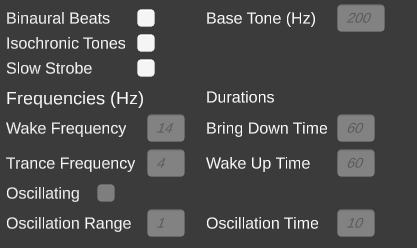 This lets the Trance Frequency oscillate a bit, meaning the brainwave frequency goes up to [Wake Frequency + half the Oscillation Range] and down to [Wake Frequency – half the Oscillation Range] over the course of the number of seconds defined in Oscillation Time. The Mind Massaging Machine is able to support the main audio file throught written text directly in front of the user. If you wrote the script for the audio file yourlsef you can easily pick phrases or wordings from there. So, if your audio file has an induction using a countdown, you can show the corresponding numbers at the right time before the user. This will show “Hello and Welcome” after 0 seconds for 1.5 seconds. At second 2.5 it will show “This is the Mind Massaging Machine” for 3 seconds. Yes, this is time consuming work. Future versions of the SessionMaker will improve on that.